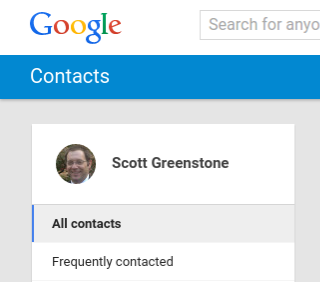 Recently, Google introduced a new Contacts Preview for the Gmail Contacts page. There seems to have been a great deal of backlash regarding the inclusion of contacts from Google+ circles in the All Contacts list. Initially the way to remove these contacts had a major impact on how things were shared with your Google+ circles. 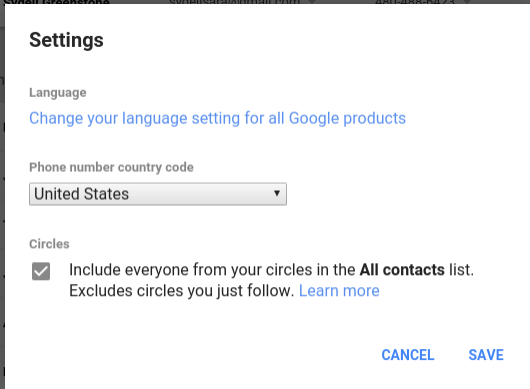 At the time, the method of removing these contacts from All Contacts required users to go in to Google+ settings and uncheck the circles that you don't want included in "My Circles". Unfortunately, by unchecking these items to remove from All Contacts also removed them from My Circles for sharing purposes. Well yesterday, I noticed a new feature in the new Contacts Preview. If click on More in the settings menu to the right and choose settings, there is a new option to Inlcude or Exclude everyone from your circles in the All Contacts list. Two points to note: 1) Unchecking this does not remove the circles from My Circles in G+, so there is no effect on G+ sharing and 2) this does not remove the Circles section from the new Contacts Preview. Hopefully you are finding the new Contacts Preview to your liking, but if you are not, you can always go back (for now) to classic Contacts by selecting the Leave the Contacts Preview option under More in the menu. Is it possible to have Contacts Preview open Inbox rather than Gmail when you click on an email address? Dave - unfortunately there is no email handler yet for Inbox. Use the feedback optiin in Inbox to request this feature as they do track these requests. I'll do that, thanks. In the meantime, do you know someone on G+ or elsewhere who does for Google Voice what you do here? On G+ a quick search for Google Voice Communities turned up some very small ones. If i have never subscribed to Google+ why has this change been applied to me? This does not show for me under settings. There is no box to check/uncheck nor the words. Does your contacts page look like the image at the top of this post? Me too - glad you like the post. Excellent. Simple and effective. Thanks. Scott, thanks for letting us know about this feature. However, what I'd really like to do is exclude all the auto-completed results of people with Google+ accounts that I'm not connected to at all. Is this possible? The option mentioned above does not exist in the preview I get on my computer, though the leave contact preview option is there. What is the point of Contact Preview if it doesn't preview MY contacts!!!! Ah, finally, thank you! Every so often I've hunted for a way to do this, but never had any luck until now. Thanks, this is awesome tip!!! How can I go back to the old Contacts page? I hate the new Contacts Preview page. I don't want to have to go to "more" and click on "Leave Contact Preview Page". I just want to click contacts and have my old page show up. I want to import gmail contacts into outlook, but I don't want to include my circles. The imported file does not include the "Circles" designation that I could sort for. Is there another way to omit the circle before importing? When exporting, select my contacts not all contacts and your circles wont export. Scott - thank you for this! I really struggled with this (on several levels) and never noticed the "More" option there (I know . . . duh . . . but I didn't anyway). So again, thanks, when I noticed your note about "More", I was like, Ohhhhhhhh! Yeah!